Are you dedicated to history? Join the Battle of Als and take part in re-enacting the decisive battle in the war in 1864. 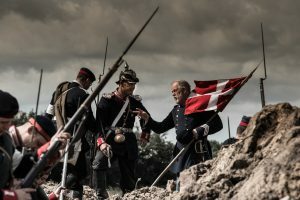 Ever since the war, the main focus has been on the assault on Dybbøl on the 18th of April, but the decisive battle took part on the 29th of June. The Historical Brigade of Als wishes to expand the knowledge this battle and needs your help. The participants get an exciting and authentic experience, as time is turned backwards to 1864. We build a Soldier Camp on Kær Vestermark (north of Sønderborg) with a camp, infirmary, a sutler and much more. During the day both Danish and Prussian soldiers participate in battle demonstrations, while the Prussian crossing to Als and the following battle is re-enacted at night. The well-preserved historical landscape on Kær with grass fields and hedges provided ample opportunities to re-enact the battle, as it took place in 1864. War does not only affect soldiers. The camp also features a home front, where we tell stories of everyday life on the farm. As a civilian you can sell historically correct goods or perform a historical art or craft. Civilians also walk in the parade Friday. 10.00-16.00: Arrival at the camp on Kær Vestermark. See map. 14.00-16.00: Enrolment in the Historical Parade of Als. 16.30: The Historical Parade puts on a drill parade for the public. 16.45: Parade from Sønderborg Castle via Brogade to the Town Hall. 17.00: The mayor welcomes the Historical Brigade to Sønderborg. 17.15: The Historical Brigade continues the parade, marching along the pedestrian precinct to Rønhave Plads. The parade continues down to the harbour and back to Sønderborg Castle. 18.30: End of the parade – transport back to the camp. 19.30: Dinner and information about the weekend. Afterwards we celebrate the Danish holiday Saint Hans with a bonfire. 06.00-08.00: Showers at the nearby farm are open. 10.00 – 18.00: The Soldiers Camp is open with a host of activities and demonstrations for the public. All participants are required to take part in the activities. All modern objects are hidden away. The Historical Brigade Als gives a combat demonstration. 19.00-20.30: Run-through of the battle and safety considerations and other preparations connected with the major night exercise at the troop landing place. 01.00: The Prussian soldiers are transported to Lillemølle, from where the crossing will take place. 02.00: All Danish soldiers march off to the landing place. 02.00: The audience is introduced to the battle. Pictures are shown on the big screen. 02.55: Danish soldiers mount guard. Tension is in the air. The spectators are gathered to look out over the sound. 03.00: The boats carrying Prussian soldiers set off from the Dybbøl shore. 03.05: Danish sentries spot the first boats and the first shots are fired. 03.10: The boats arrive and the Prussian troops storm ashore. Now follow the decisive engagements. 04.00: The battle is over. The wounded is carried to the infirmary. The visitors greet the participants of the Historical Brigade Als. 08.00-09.00: Showers at the nearby farm are open. 08.00: Breakfast. Thank you for a lovely weekend!